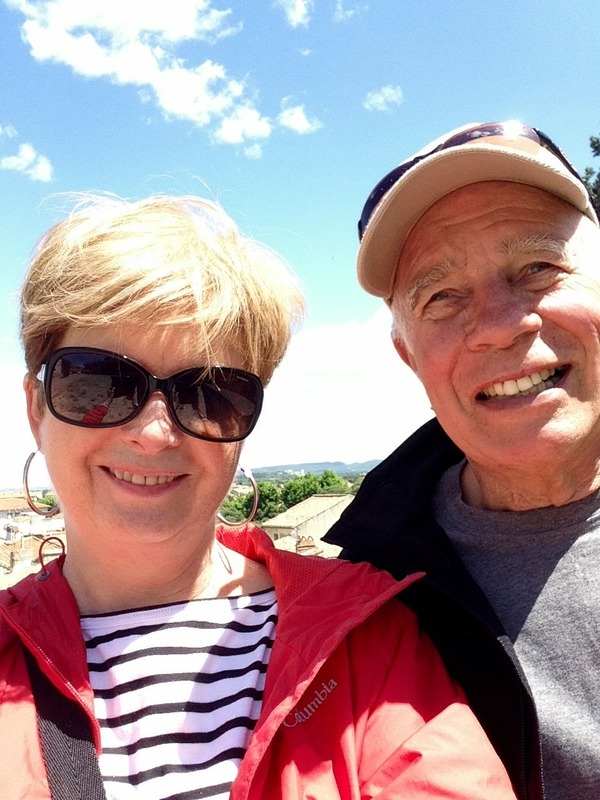 Finally, finally two weeks into our trip to France, we arrived in Provence, and encountered sunshine and warmer temperatures. It was even hot one day. Ahhhh. That felt good. The best thing about staying in self-catered accommodation is the freedom it allows. Once settled into our little stone cottage overlooking a vineyard, we could wake up a bit later; unlike staying in a B&B, we didn't have to present ourselves for breakfast at the agreed upon time, or pack the car and get on the road for our next destination. We could make a pot of tea, go for a morning power walk on the unpaved roads that snaked around us, all the while trying to surreptitiously peer through the gates our neighbours' properties to see how the other half of Provence lived, and return "home" to shower and decide our plan for the day. And maybe have another cup of tea. For six days we cooked for ourselves. 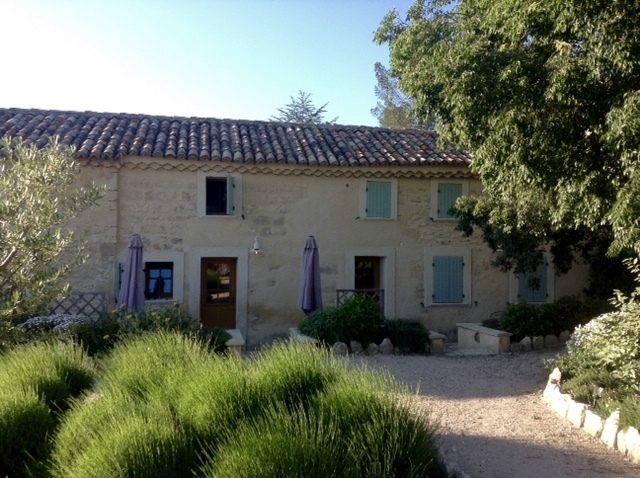 We barbequed, made huge salads from the plethora of fresh produce available, bought bread every day at the local boulangerie, snipped fresh rosemary and thyme from the lovely herb garden right outside our door, and enjoyed some of the local wine. ... and that famous pont we all learned to sing about in French class in grade five. 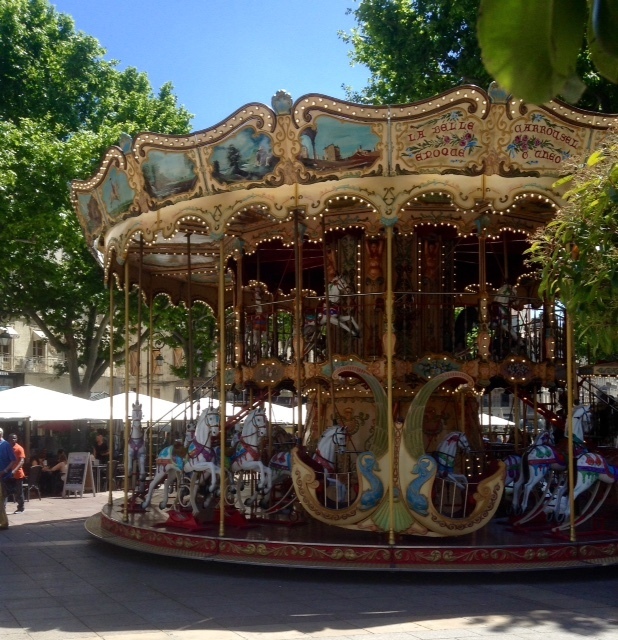 I was enchanted by the carousels in France. We saw a couple of these in Paris, but this one in Avignon was wonderful. It had two levels of prancing horses and even a pig. Oh, it was hard to walk on by and not go for a merry-go-round ride that day, I can tell you. ... where we could look out over the vineyards and across hazy mountains. Then we descended back down to the heart of the village and stopped into a wine tasting shop. We sampled a few varieties of the red wine Chateauneuf du Pape is famous for, and selected a couple of bottles to take home. Along with a wonderfully aged black olive saucisse. Ugly to look at, kind of shriveled and covered in white mold...who knew it could taste so scrumptious. Perfect with sliced tomatoes and fresh bread for lunch. A couple of days later we set off early in the morning for Arles. This was a wonderful day. 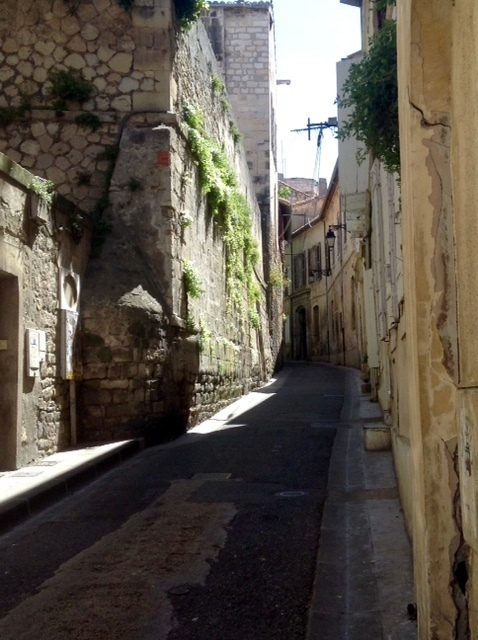 We explored the winding streets of Arles, once a thriving Roman settlement. 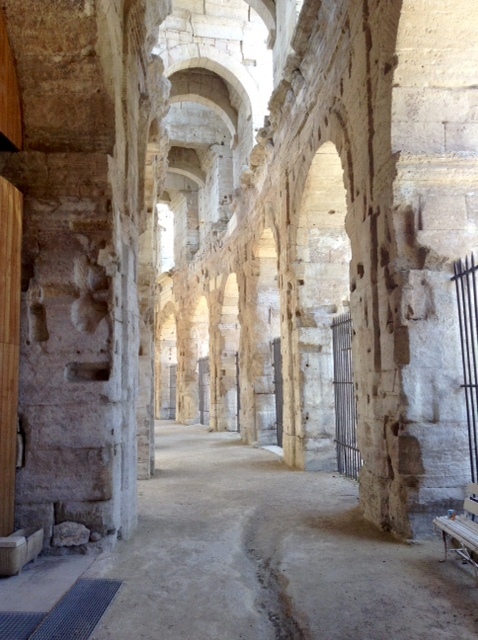 We gazed up at Roman columns and sat in the Roman arena where they still hold bullfights in the summer. Later we drove out to the coast, through the marshy flatlands of the Camargue where they breed the black bulls and the creamy white horses that have become synonymous with the area. We arrived at the seaside town of Saintes-Maries-de-la-Mer, parked the car and carried our picnic cooler down to the beach. 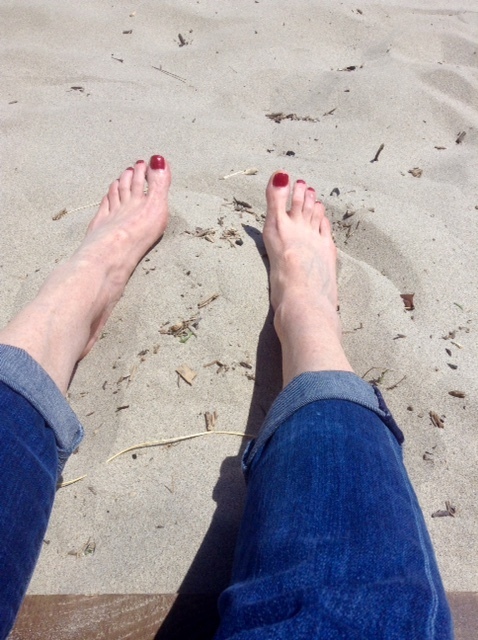 Finally, I could wiggle my toes in the sand of the Mediterranean Sea. Cool. Well, actually... that sand was pretty darned hot. We ate our lunch behind a windbreak since the day had become very, very windy. Sand blew around us, into the cooler, and down our necks. No need for salt on those tomatoes...they were liberally sprinkled with sand before we could gulp them down. Still it was sunny and the sky was a brilliant blue. And it was France. What's to complain about, eh? 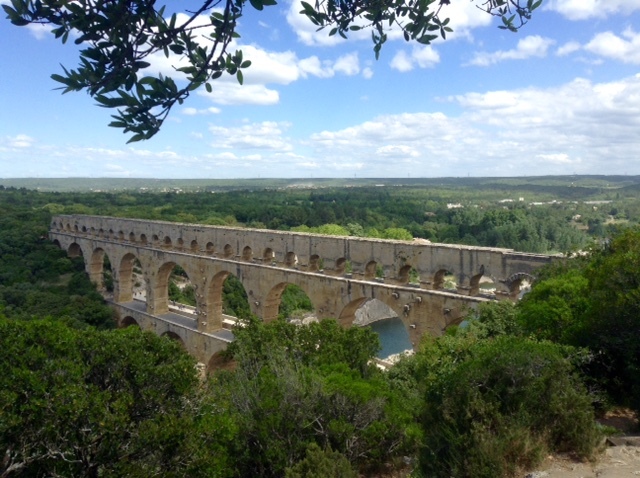 Our last day we visited the Roman aqueduct, Pont du Gard, near Nîmes. Hubby remembered visiting here in the sixties with his parents when his dad was stationed in France with the Canadian Air Force. Long before access to the site was as closely controlled as it is now, they camped near the foot of the aqueduct and he and his little brother climbed to the top of it one night. We would have to be content with crossing the bridge at the lowest level and scrambling up the path that snaked through the trees overlooking it. What an impressive sight. We were definitely Roman around Provence. Ha. I know, really bad pun. Sorry. Although you can't tell from our pictures, the famous mistral winds had started blowing the day before when we were in Arles. I must have found a calm moment to take that shot above because my hair seems to be not standing on end for a change. And like in Mary Poppins, the change in the wind meant we would be moving on. Tomorrow we'd be packing the car and saying farewell to our cottage. With a little over a week left in our trip, we were headed back north. We'd spend a few days in the Parc National des Cévennes, and then move on to the Loire Valley. I was excited for the Loire and chateau country. But France had a few surprises to throw at us before we reached there. 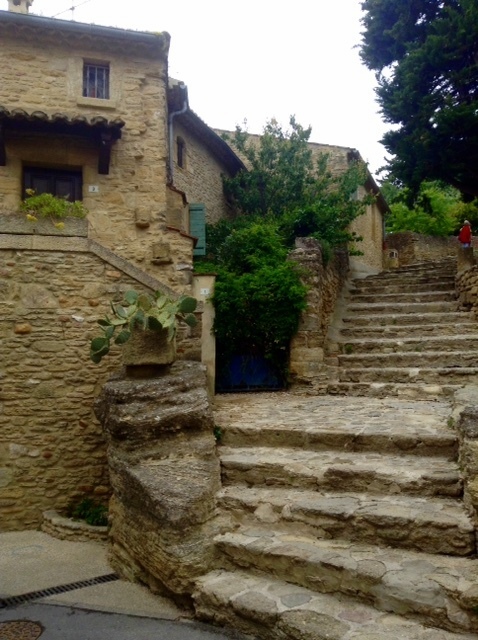 We'd seen some historic and famous places while in Provence, but the Languedoc was soon to remind us that often the best moments when you travel are the unexpected ones. But what about you, dear readers? Are you getting tired of hearing about France? Maybe I should take a break and write a fashion post. Huh? Well , I'm really enjoying your travel reports . You don't mind telling us about the lows (not many fortunately ) as well as the highs , which makes it all more personal & real , bringing back memories of our own travels . I love your self deprecating humour too - not a lot of that in the blog world . The shot of you outside the expensive restaurant in Paris was priceless - reminded me of Lucille Ball ( with less lipstick) . I'm already wondering about your next trip - where are we going? Oh...great comparison....thanks, Wendy! And thanks for hanging in there. certainly not tired of the travel posts. i am traveling vicariously and loving it. Thanks, Susan. I've a few more posts before I'm done with France..for now, anyway. Susan, Loved the Mary Poppins reference. Keep the travel blog and photos coming. Mary Poppins was such a huge movie when I was a kid. Went with a friend to the movie last year about the writer and the making of the original Disney movie...we sang along to all the songs. Must have been most annoying to those around us. No, no, keep going! Your time in the cottage sounds lovely and relaxing - travel can be a bit hectic. Looking forward to the rest of the trip - and the fashion can come afterwards! Thanks, Patricia. I thought I should ask...other people's travel pictures can get boring after a while. I agree with Patricia! Keep them coming! Especially about the Languedoc! Thanks. Lanquedoc post coming up. Oh yes please keep on posting. The French countryside is gorgeous. I was staying in the Midi Pyrennes after Paris and the pace of life is pure bliss. Your trip sounds lovely and your pictures are beautiful. Merci! Thanks. Your trip sounds lovely as well. And you're right the French countryside is gorgeous. Never get tired of this! We did the same trip ten years ago. Can't wait to get back. I'm living vicariously through your word and pictures! Thanks Diane. It's fun to hear about trips to places where you've been, isn't it? Not too much at all! 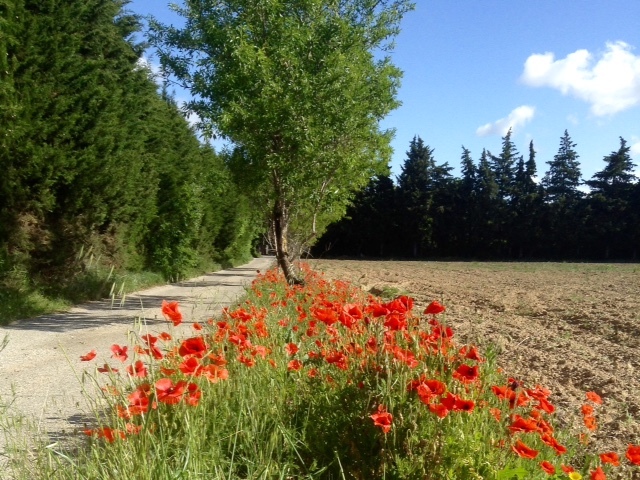 We've not been in Provence for decades and you're bringing back memories as well as showing many new spots. Gorgeous photos! Isn't it wonderfully expansive to settle into one's own temporary digs for a few days after being on the move? Those cups of tea. . . precisely when you want them, brewed just the way you like them . . . The tea is crucial! Must have my afternoon cuppa....or I get very cranky. No way, love your travel posts. Will be visiting France in the fall and am soaking it up. Of course all roads lead back to fashion. When you get back I want to ask you about the red coat! Thanks, Susan. "All roads lead back to fashion".... you're a woman after my own heart. Really enjoying your travels! 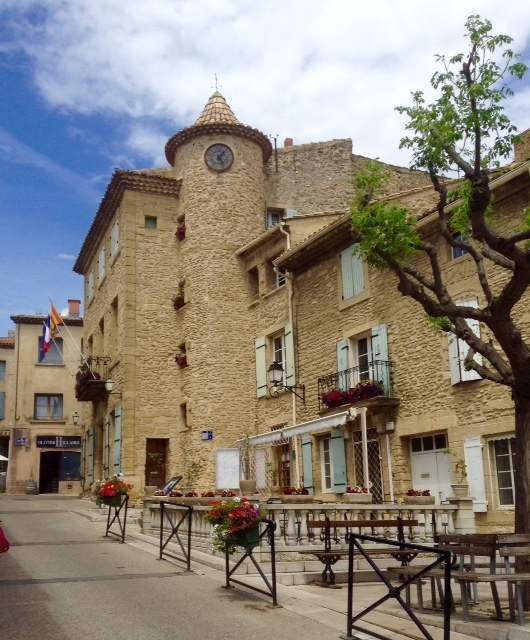 We have rented several houses in Provence and agree, it is THE way to go. Will be going for a month next summer and am already excited. BTW: how did your packing and clothes go? Enough, too much, correct things? Want to hear about that! Thanks Libby. I will definitely be doing something about the packing. Some hits, some misses... some stuff I'm very sick of wearing. Thanks Iris. Oh, Lanquedoc was wonderful. More on that in the next post. 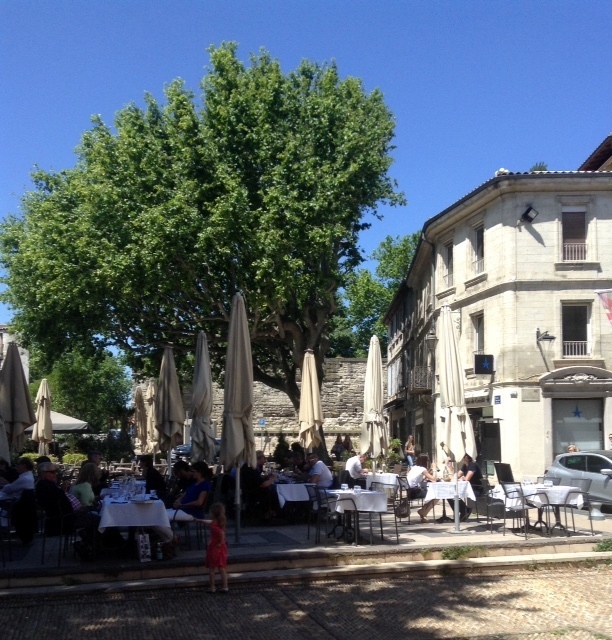 Arles is indeed beautiful. We were there on market day. What a crush....but such an interesting crush! As far as the wind goes....exfoliation is right! I just love all the stone, and the vistas. Brings back memories that never fail their happiness duties. No worries Sue. I'm really enjoying reading about your travels through France and your photographs are really beautiful! A welcome distraction yesterday between a visit to the opticians and the doctors!!! :) I've also found as I've got older that staying in a cottage or apartment is much more relaxing than a hotel or b&b. Also it's easier to feel part of a community , visiting local shops, markets etc .... Wineries if we re lucky!!! Thanks Rosie. We've rented cottages on most of our trips...in the Yukon, Ireland, Australia and even the Orkney Islands in Scotland. I love being able to spread out, often having a patio or a barbeque, and buying fresh veggies....and wine, of course. In Australia we stayed in lovely cottages in caravan parks, and met and had supper with lots of interesting people at the communal barbeque areas. I am enjoying going through your trip recap through France! I could read trip reports to Europe all day long. 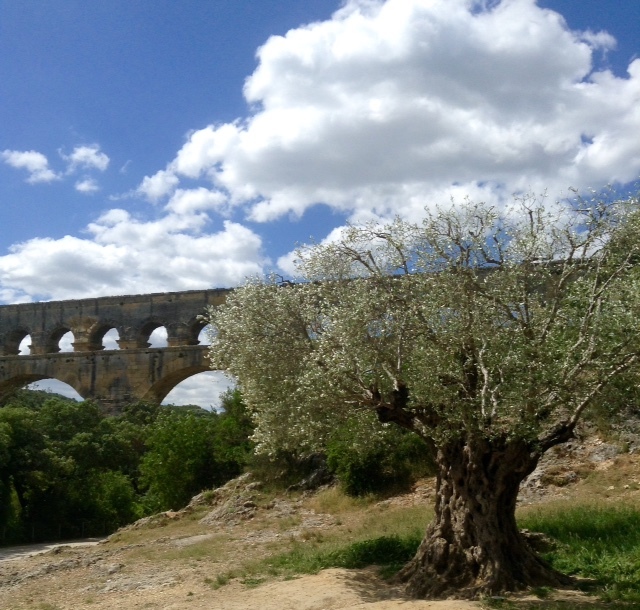 It's hard to believe that such an old Roman aqueduct is still standing. Probably still works!